From simple to complex, word tattoos convey a range of designs, style and emotion. No wonder they are quickly becoming one of the more popular types of tattoos to get today. Why Use Words in a Tattoo? Tattoos are a means of personal expression and decoration. Some people choose to use their skin as a canvas for artwork, while others choose to use a tattoo to declare to the world a personality trait or journey they've been on. For those who wish to make explicit their meaning, word tattoos can be the perfect vehicle of expression. Whether you include text inside a large tattoo, or the words are meant to stand on their own, there's more to designing a word tattoo than merely choosing the letters. Font, handwriting, size and placement of the word can all have a big impact on the finished design. 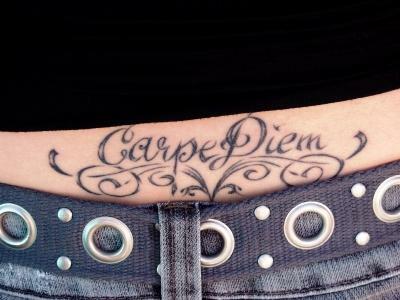 When planning a tattoo with words or letters, be sure to take these traits into consideration. If you don't want your own, a loved one's or your tattoo artist's handwriting on a tattoo, make sure you put some consideration into the font. Nearly every font available for books, computers and type writers can be transformed into a tattoo. Try printing in various fonts in the size and color you want your finished tattoo in, to see how they look across your skin. Handwriting and calligraphy are two ways to add a little bit of a design element or flourish to a tattoo made up solely of words. One way to add an extra touch to a memorial tattoo is to copy letters from a loved one's handwriting to join together into the word for your tattoo. Alternatively, you can use calligraphy to transform simple word tattoos into complete pieces of art. While word tattoos can be used anywhere on the body, give some extra thought to both the size and placement of your lettering. Large, flat areas such as the back, stomach or chest may accommodate larger words or sayings easier than a curved surface such as an arm or leg. If the words of your tattoo are wrapping a limb, it can make it more difficult for the word to be translated properly by the viewer. Additionally, dips in the muscle and curvature of the body can distort a word or sentence. Making a tattoo stencil of your word first and placing it in various parts of the body can help determine how good the fit will be beforehand. A word tattoo doesn't have to mean letters or characters standing alone. Consider hiding letters inside a larger design for an optical illusion, using vines, stems or flowers to create words and letters or adding a banner inside a larger tattoo design. Just be sure to consider how much you want others to read your message; if the word in the tattoo is more private, disguise it, if you want it read loud and clear, keep the letters separate from other designs. Whether your word tattoo is meant for others to see, or just a motto or name you wish to carry close to you always, make sure it has meaning that will last your lifetime. Avoid getting expressions or sayings that don't speak to you on a personal level, and that might embarrass or make you uncomfortable as you get older. If a tattoo is an expression of who you are, a tattoo with words is one that speaks so all can hear. Make sure you stand behind what it's saying to ensure your tattoo's continued expression of your life.